This is a mom who fiercely protects her children and gets a statue raised in her honor. 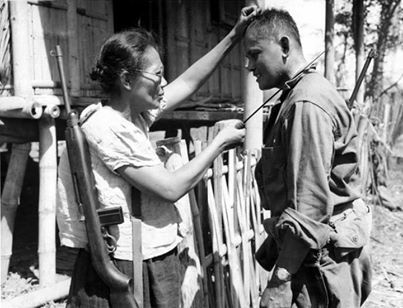 She then went on to kill over 200 Japanese soldiers during the war with a group of commandos and holds the distinction as the only female commander of a resistance group in the Philippines. In this photo she is showing U.S. Army Pvt. Andrew Lupiba how she used her bolo to silently kill Japanese sentries during the occupation of Leyte Island.